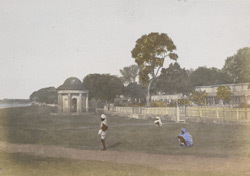 A hand-coloured print of classical pavilion on the banks of the Hooghly at Barakpur, from the Fiebig Collection: Views of Calcutta and Surrounding Districts, taken by Frederick Fiebig in 1851. Barrackpore, 24 km to the north of Calcutta on the river Hooghly, was originally permanent barracks for the British army and later became the summer residence of the British Governor Generals. Marquess Wellesley was British Governor-General in Calcutta from 1797 to 1805, and made many improvements to Barrackpore. He had the gardens of Barrackpore Park laid out in the 'English Style' and the extensive grounds contained a theatre, an aviary and a menagerie. This is a view of the unidentified memorial, in the shape of a circular pavilion with a shallow dome on the river at Barrackpore.